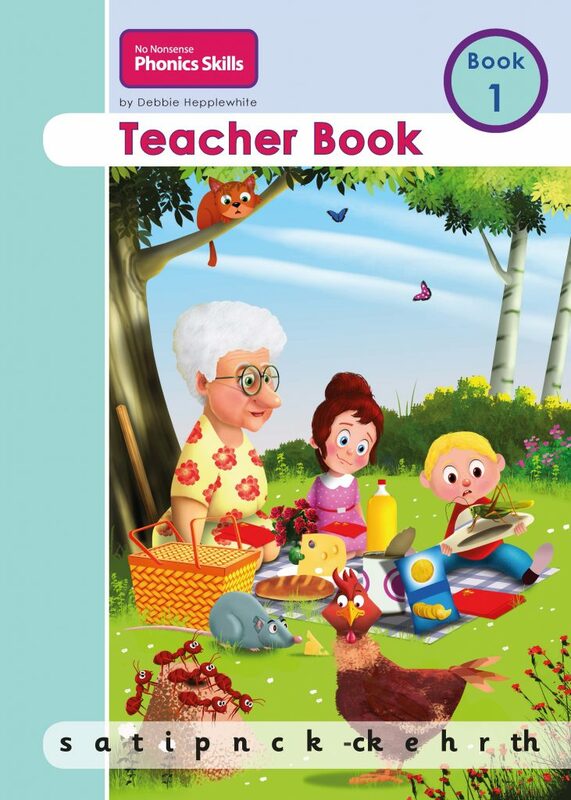 Each of the nine No Nonsense Phonics Skills Pupil Books has a parallel Teacher Book to provide additional guidance and explanations for the teacher (who could be a class teacher, teaching assistant, special needs teacher or assistant, tutor, home-educating parent or carer. Please note that these books can also help to train student-teachers). The programme is suitable for mainstream class teaching, targeted support, intervention or for tutoring purposes – and whether English is the mother tongue or new or additional language. The rationale of the programme’s resource-design and guidance is outlined in the Teacher Books informed by the international research on reading and leading-edge practice and experience. This includes: The Five Pillars of Literacy, the Simple View of Reading and Debbie’s two-pronged systematic and incidental phonics teaching approach. In the Teacher Books, additional guidance for the delivery of the programme’s content is provided through a detailed Teaching and Learning Cycle and the phonics routines are described in full for the Multi-skills Activities pages. Comprehension question suggestions are provided, per book, for all the programme’s Mini Stories. In each Teacher Book, the content of its parallel Pupil Book is fully replicated. Additional guidance is provided on ‘post-its’ within the Pupil Book section for continuing professional development to make the most of the programme’s resources and activities. This approach for additional teacher-guidance makes the Teacher Books very easy to use. There is necessary repetition throughout the Teacher Books as, in practice, no one adult may find that they deliver the full programme to the same learner or learners (for example, the learners may have progressed to another year and another teacher). This means that each Teacher Book needs to ‘stand alone’ as well as form part of a cohesive whole programme. It is highly recommended that the teacher reads through the Teacher Book for any particular Pupil Book in its entirety to assimilate all the guidance and content before using the Pupil Books with the learner or learners. Dependent on the stage of learning and need of the learner or learners (the books are not age-specific although you can start Book 1 with four to five year olds – no younger! ), a teaching adult may need to ‘pick-up-and-go’ with any of the Pupil Books. Additional material and guidance for ‘Entry Point Assessment’ is provided via the USB stick included in the No Nonsense Phonics Skills Box Set – otherwise, simply assess the learner’s knowledge of the alphabetic code (“see the letter/s, say the sounds”) and make a professional judgement for the ‘best fit’ Pupil Book to start with based on the learner’s level of language comprehension and spelling ability of the Mini Story pages if given as a dictation. Avoid skipping parts of the Pupil Books on the basis that the learner may already know some of the featured letter/s-sound correspondences. Always start at the beginning of the ‘best fit’ book and complete all the activities to secure maximum benefit including learning new vocabulary and constantly building up knowledge of spelling word banks. Weight and dimensions include packaging. VAT is not payable on Teacher Books.